This series is adapted from a sermon I preached on August 3, 2014, “What should we think about Israel?” See below for part two, “Modern Israel is not Biblical Israel.” Follow the links throughout for sources and more information. It’s interesting watching my Facebook feed whenever Israel is in the news, which seems to be nearly always. I have Christian friends on Facebook who are decidedly pro-Israel—they cheer every move Israel makes and applaud Canada when it “stands with Israel,” and they boo western media and Canadian politicians that dare to criticize Israel. For them, Israel can do no wrong: Israel is a modern miracle, the fulfillment of biblical promises, God’s holy nation with a divine right to the land they’re in. But then I have Christian friends on Facebook who just don’t follow the same script. They speak of “Israel-Palestine,” or sometimes just “Palestine,” but not “Israel.” They advocate for Palestinian refugees and speak out against Israeli settlement on Palestinian lands. They highlight the Palestinian casualties in Gaza and downplay Israeli losses. They cringe when Canada stands uncritically with Israel. For them, Israel is just another nation. As Christians, how should we think about Israel? There are no simplistic answers to this question. It’s complicated—and contentious. What I offer here is my own perspective as an expert in biblical theology and an admitted non-expert in Middle East politics. As I note at the beginning of each post, I encourage you to click through the links to dig into things in more detail—and to think through all this for yourself. Let’s start with some history. The Palestinian crisis—like many of the conflicts in our world today—has its roots in a global event that started one hundred years ago this summer: the First World War. The so-called “War to End All War” was in fact the war that spawned a century of wars (and counting). Meanwhile, over in Europe, Germany was left demoralized after the war. Strong voices spoke out from the rubble with brash promises of Germany’s rise to prominence once again. The strongest of these voices? Adolf Hitler and his National Socialist German Workers’ Party—the Nazis. By 1933, a mere 15 years after the First World War, Hitler was in power and Nazi policies were made law and implemented with frightening speed. This, of course, led directly to World War II. Once the smoke had cleared after this next global war, the world was horrified at what Hitler had done: eleven million “undesirables” killed in Hitler’s Holocaust, including over six million Jews. This led to a sudden increase in sympathy for the Jewish people and their plight, which in turn added fuel to a Zionism that had been growing for decades. It was this precise mix of ingredients—the instability of the Middle East in the twilight of the British Empire, the horror of the Holocaust under Hitler’s Nazi Germany, and Zionist dreams of an independent Jewish state—that led to the creation of the modern state of Israel in 1948. 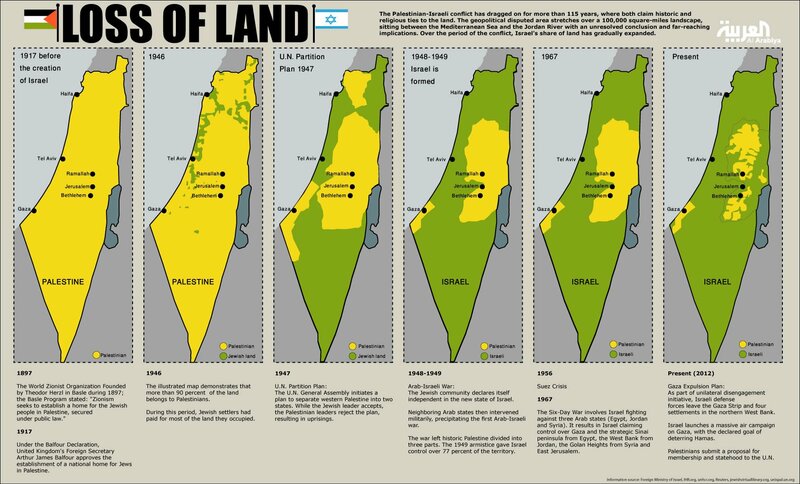 The land of Palestine, however, was to be shared. Up until World War II there were a few Jewish settlements in Palestine—at the beginning of the war less than 30% of the total population living on about 5% of the land. It was mostly inhabited, though rather sparsely, by native Palestinians: Arabs who had lived for centuries under the Ottoman Empire, mostly Muslim though some were Christian. Under the plan proposed after the war, Jews who had been without a state of their own for centuries were given roughly half of the land of Palestine, and hundreds of thousands began to stream there from around the world. The other half was for the native Palestinians, but involved the displacement of some from their home regions. Though maps such as this are not without problems in bias (scale, labeling, etc. ), they do give a good rough portrait of land ownership changes in Palestine over the past 100 years. Newly-formed Israel agreed to the land partition but the surrounding Arab nations did not, and immediately war broke out. Between 1948 and 1967, Israel took as spoils of war another roughly 25% of the land of Palestine, displacing hundreds of thousands of native Palestinians, their descendants still refugees today (such forced displacement happened both ways, by the way, as hundreds of thousands of Jews fled Arab nations to Israel). And since 1967, Israel has unilaterally settled thousands of Israelis within that one-quarter of the land that is still Palestinian. Today, most Palestinians in the land live in the tiny sliver along the Mediterranean coast that is Gaza, or in the West Bank on the eastern side of Israel. To put it mildly, the land is disputed. And solutions are thin on the ground. Once again, as Christians, what are we to make of this? How should we think about Israel? More on that in the next post. See here for part two, “Modern Israel is not Biblical Israel.” Cross-posted from http://www.mordenmennonitechurch.wordpress.com. © Michael W. Pahl.